Shown in white, but shipped in all anodized black. The Antares Versascope is a very versatile accessory. 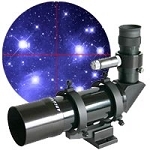 This is a 10 x 60 crosshair finderscope providing a very inexpensive way to either upgrade your current finder. 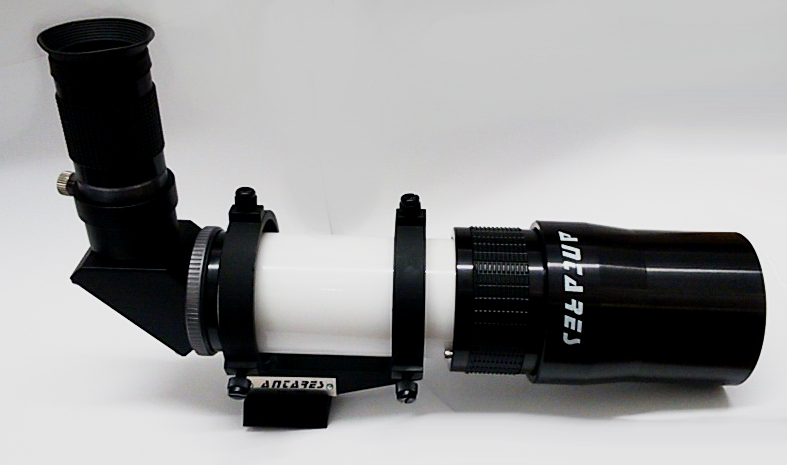 It also features a front focuser for easy focusing and a wide field 25mm crosshair eyepiece for easy alignment. The 90 degree prism will correct the view for the right way up images. The rear of the finder has a 1.25" twist lock adaptor for the best hold possible. If you unscrew the adaptor, this will give you a T thread so you can other accessories while still being able to focus using the front focuser. The scope also has a built on dew shield to battle dew forming on the front of the lens. There is nothing on the market that can touch this. Very versatile and very easy to use.